We start with the pec deck for three reasons. First, you want to build your chest up, so your first set of 20 reps is a low enough weight to get your pec muscles primed and ready. Second, the pec deck stretches the fibers of your chest so you can pump more blood into those muscles later. Lastly, you’re establishing the important mind-muscle connection so you can maximize your pec potential for the rest of the workout. You’ll notice the reps drop down with each set. Normally you would increase the weight as the reps go down, but you won’t here. Instead, you’ll hold the stretch for each rep a little longer with each drop in reps.
For the first set, perform the reps as you normally would, with a regular tempo and a brief pause on each stretch before contracting the muscles and squeezing your arms together. On the next set, drop to 15 reps but hold the stretch position of each rep for two seconds before squeezing your arms back together. On the final set, hold each stretch for four seconds, again decreasing the reps to only 10. Stretch while you rest between sets, which should be around 60 seconds. If you’re able, slide an adjustable bench inside of a rack for this exercise, and use a slightly lower than normal incline. This will help you place more emphasis on the upper pecs while keeping the front delts from taking over. It’ll also help you to push slightly more weight. 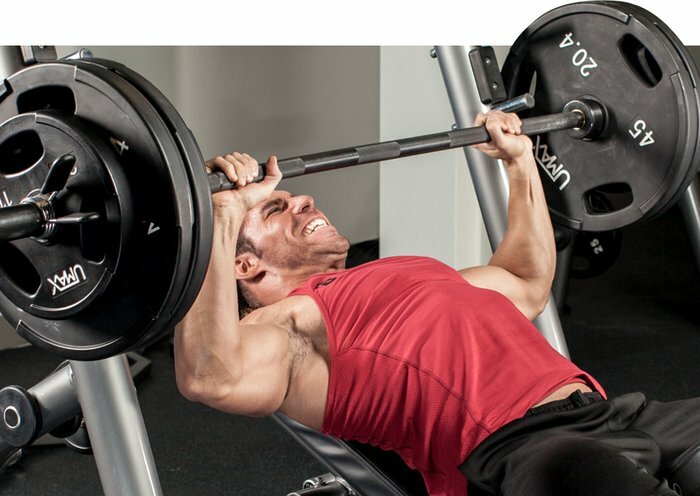 If this is not possible, a traditional incline bench will also work. Pick a challenging weight you can still reach 5 reps with. At the bottom of the exercise, pause for a count of one before pressing back up. Once you’re ready to press, don’t play around: Explode with force as you press that heavy weight up. Control the weight back down as you prepare for the next rep.
Make sure you have a spotter there to help, but don’t let them do all the work. If the weight is too heavy, put your ego aside and drop to a lower the weight—egos don’t build muscle, but proper reps do. Also, make sure you retract your shoulder blades and hold them together so your chest does more work. Since you’re going fairly heavy for this exercise, rest for two minutes between sets. On this classic chest-building exercise, we’re going for pure hypertrophy. Dumbbells give you the freedom to rotate your wrists in whatever direction feels most comfortable and provide a better range of motion, so don’t hold them like a barbell! Take advantage of what the dumbbells have to offer and hold them at a slight angle, lowering the weights as far as you safely can to maximize the distance they travel. Squeeze them up and together over the pecs when you come back up. You don’t have to let the weights touch, but they should be close at the top to maximize the contraction of the pecs. The reps on this exercise are a little higher, but you need to push yourself to grow. If you get 11 reps, you need to grab the next pair of dumbbells up. If you fail to get at least 7, lower the poundage for the sake of gains. Take 90 seconds of rest between sets, and don’t forget to stretch! Have you ever seen a guy with an upper chest that was too big? Me neither, so it’s back to incline! Now you’re further into your session, and you can incorporate machines into the workout to help control the path of travel. For the incline cable fly, the elbows should be slightly bent—but don’t go with a full 90 degrees. Take two seconds to lift the weight up and squeeze those pecs hard at the top. Lower the handles back down in a three count and hold the stretch for a count of one before performing the next rep. Rest 90 seconds between sets—this should be plenty of time to help you recover before going again. Nothing beats a good bodyweight movement to finish off a training session. For chest, you can’t beat dips! The goal now is to get as much blood into the chest area as possible and leave everything you’ve got in the weight room, which means adding extra resistance. You can use a dip belt or a weighted vest—whatever works for you. 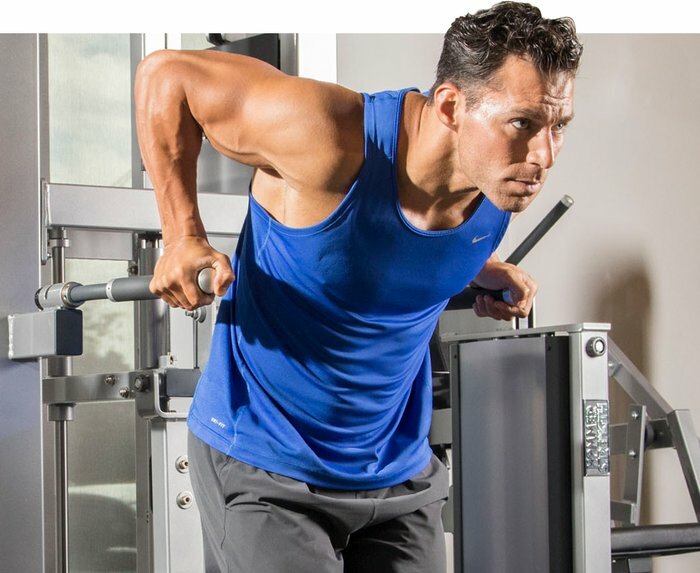 If you can’t do full bodyweight dips, find an assistant to hold your feet and help you, or use the assisted dip machine, which will allow you to adjust the counter resistance for each set. For this final exercise, knock out as many reps as you can with the extra resistance. As soon as you hit failure, lighten the weight and resume your reps. If you’re on the machine, you’ll increase the counterweight. Once you reach failure for the second time, you’re done for that set. Now you’ve got one minute to stretch your pecs, sip water, or BCAA’s and prepare to grind again. Three rounds of this and you’re done!